With every passing year, there are more and more Indian companies, particularly automotive component suppliers, being awarded the prestigious Deming Prize, which is recognised the world over as one of the highest awards in Total Quality Management (TQM). Established in 1951, it recognises both individuals for their contribution to TQM as well as businesses that have successfully implemented TQM. The latest home-grown Indian supplier to bag the Deming Prize is the five-decade-old Sundram Fasteners Ltd (SFL) from the TVS Group. The recognition comes for not one or two plants but all of seventeen. Unique because typically companies pitch for a Deming with a single manufacturing plant, partly because the award process is extremely rigorous and demands extremely high and unwavering standards of quality. “It is always exciting when the recognition comes from your peers. The audience at the Deming awards comprises people representing the who’s who of quality in the world. For them to compliment us on our achievement was really a proud moment. They also pointed that some of our efforts have been the best seen in any organisation in a shortest period of time, and that too for so many plants at one go, and inclusive of many technologies,” says Arathi Krishna, managing director, SFL, in a candid interview with Autocar Professional. To briefly put it, in the journey to Deming, SFL has achieved significant improvements in overall performance, primarily in manufacturing quality. What’s more, TQM has also helped to establish a culture of Total Employee Involvement (TEI) and helped deploy company policy and objectives systematically across the organisation. Set up in 1966, the Chennai-based SFL today is a global supplier of high-tensile fasteners, powder metal components, cold extruded parts, hot forged components, radiator caps, automotive pumps, gear shifters, gears and couplings, hubs and shafts, tappets and iron powder to the automotive, infrastructure, windmill and aviation sectors and caters to customers across India, China, Europe, USA and South America. In FY2018, the company registered a turnover of Rs 3,387 crore and is one of the fastest growing automotive suppliers in India. What helped SFL in its drive towards TQM is its solid foundation in total product management (TPM), which acted as a catalyst. The company has consistently achieved exceptional productivity on the shop floor, superior uptime of machines and minimal breakdowns. Over the years, it has also acquired cutting-edge technological competencies in forging, metal forming, close-tolerance machining, heat treatment, surface finishing and assembly. Nevertheless, there was still variability in processes and some defects which the company was unable to pinpoint to completely erase them. “TPM in the past has helped us in several ways across the company but today customer demands have catapulted hugely in terms of quality. For example, earlier the quality benchmark was parts per million (PPM); today, it is incidents per billion, this is where we are measured by our customers. This made us think over enormously capable processes which then bring first-time-right product. This is what has driven us towards adopting TQM,” says Arathi Krishna. SFL’s Deming journey began in 2012 and, like any other Indian company, the approach was taking one step at a time by validating two plants which were the most modern and catering to global clientele. However, after successfully implementing TQM practices in these two plants, there were dramatic improvements in product quality and a marked improvement in overall efficiency. Reason enough to go in for the very ambitious goal of taking all 17 SFL plants to TQM philosophy and practices. “Targeting such a huge goal was a big challenge as well as risky because if one person fails, the entire exercise may fall apart. Therefore, it was important for us to upgrade everyone. But the result at the first two plants made us determined to target Deming for the entire organisation,” says N Balakrishnan, president – Fasteners & Hot Forgings and company veteran. The overarching goal at SFL was to enable a fundamental change in the approach towards manufacturing. Key departments at each plant would have to participate in a learning session with the world-renowned TQM expert Yasutoshi Washio from JUSE or the Union of Japanese Scientists and Engineers. This was followed by classroom sessions with representatives from each division and unit. Likewise, on the shopfloor, every single do and don’t was identified. Considering that SFL has a host of products, processes and treatments, adapting to new practices was easier said than done. However, meticulous following of the TQM process helped bring about standardisation. For other divisions like HR, marketing, finance and CSR, corporate sessions were also held. This ensured that each and ever staffer at SFL was exposed to TQM and its benefits. Happy team members of the SFL plant at Mahindra World City, Chennai, which was the first of the 17 manufacturing plants to adopt TQM practices successfully. “A six-year duration is not necessary due to 17 plants. In fact, the duration actually depends on every company’s level in adopting the new practices. Most of our plants had TPM knowledge, which is quite alike TQM, but hasn’t covered management functions,” says Balakrishnan. The Deming Prize is awarded by the Japanese Union of Scientists and Engineers (JUSE) which consists of a Deming exam committee. Also to measure in TQM is policy deployment at a company and essentially requires a minimum three years of rotation to observe any fundamental transformation. That’s because companies have to learn and practice these new methods and process, find out the gaps and revise plans. TQM essentially is an all-out focus on quality in all operations from manufacturing to finance, HR and CSR. It is a scientific approach with statistical and data-driven information that help achieve startlingly positive results. What really worked in SFL’s favour is the company’s sustained practice of continuous focus of kaizen (continuous improvement) and best practices across all its 17 plants. Hot forged parts for the automotive sector. 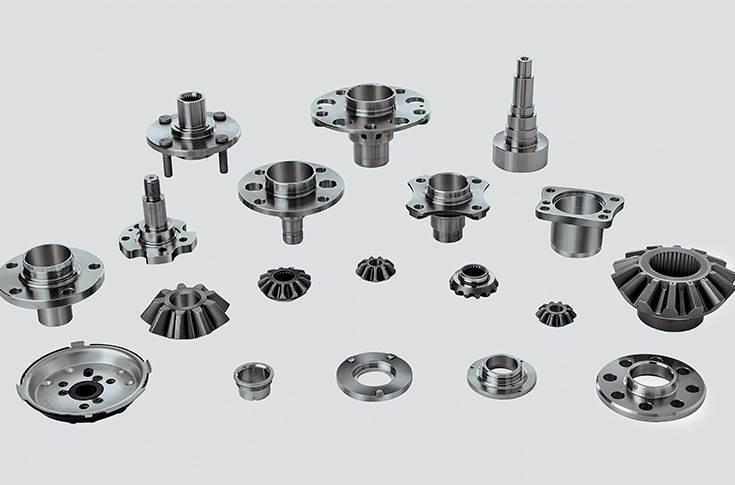 These include bevel gear and pinion, hub and Gen 3 bearing hub rings, clutch hub, crankshaft sprocket, turbocharger parts and connecting rods. Each of the 17 plants vied to be the best and if one of them was able to achieve a superior result and bagged more business due to its superior processes, better output and improved quality, it only served to motivate the others (plants) to work towards the same higher-quality goal. In a six-year period, there is always a challenge of a loss of focus. In 2012, the initial focus was on pre-diagnosing goals before going in for the final diagnosis. Five years later, in August 2017, the goalpost had shifted towards achieving higher quality and processes. A couple of plants did lag behind the others but every effort was made to help them pull their weight and achieve TQM parity. “We experienced small wins during this journey across the company, which helped in keeping the focus on the goal. There were visible signs of increased profitably, new business wins and expansion of market share, which everyone started to enjoy. This is the reason why there was continuous discipline and commitment during the five-year-long period,” says Arathi. SFL’s plant in Mahindra World City located in Chennai and an export-oriented unit, was the first one to embark on the TQM journey. This correspondent visited the plant to take a closer look at the TQM practices in place. Set up as a greenfield project in 2007 to cater to a USA-based customer, which was sourcing critical powertain products for the first time from India. Today, this plant has expanded supplies to other clientele in Europe, Asia, South America and South East Asia. World-renowned TQM expert Yasutoshi Washio, himself a winner of the Deming Prize for individuals, guided SFL on the path to the Deming Prize. The goal was to improve the manufacturing and enhance shopfloor quality through TQM practices. At the time the Japanese TQM professor visited this plant for the first time, the rejection level was at 11-12 percent, rather high as per industry standards. The target was slash it down to 2 percent within 90 days — extremely challenging — which the team believed was unachievable. However, with meticulous attention to the standard operating procedure (SOP) and quality systems, the manufacturing systems were recalibrated with fully engaged employees who ensured total adherence to the SOP in every operation and process. Prof Yasutoshi Washio also taught the ‘QC Story’, a device of TQM intended to solve problems in a structured manner with training sessions for all employees across the plant. There were several measurement tools like data history sheets in every process, machine and operator to record micro details which provided plentiful insight in the manufacturing processes and also helped in understanding the pain-points. Also, in higher rejections, process monitoring charts were initiated to restrict passing the defect from one workstation to the next. “We were discussing SOP for almost six months, understanding the basics about how to write and follow it. The professor physically went around the assembly line, put across different parameters, tools, controls and checks, which operators had to comply with. Once an extremely robust SOP was established and complete adherence followed, it is not possible to produce defects. Convinced with the result, we stop inspection at any level,” explains Ramesh. Painstakingly following the TQM processes produced amazing results and the defect levels soon fell from 11-12 percent to 5-6 percent within six months, and further to one percent in two years, which SFL says is the best in India. Each product has over 130-150 dimensions and every dimension has to go through rework. Following consistent work for two years, step by step, zero rework was achieved. This plant currently makes 30,000 shafts each day and there is not a single rework at the shopfloor. This has helped in bringing down rejections, saving costs, resources and boosting efficiency. Swayed by the results, SFL decided to go the whole hog for TQM across the entire company. Winning the Deming Prize has given SFL, its management and personnel across all 17 manufacturing plants staffers a huge boost of confidence. Going forward, the goal is to ensure every process, every product line and every staffer across functions maintains the same high-quality standards. SFL, which had won the TPM Excellence Award from JIPM, Japan in 1998 and was the first in the engineering industry to do so, has just raised the benchmark for all suppliers — and how.